Chilli Non Carne – Food. Boom. Ye Gods I’m going to start getting hate mail from the local butchers soon but here goes, it’s Vegetarian Day according to Google. I have unintentionally fallen into line with this by coming home and knocking up a big pot of spicy beans. This is because I still have stock to use up from the whole vegan experiment and have a busy couple of days coming up where it will be useful to come home and have a re-heat dinner on hand rather than actual cooking. A chilli really is one of those staples you should have mastered by the age of twenty one, or considerably earlier if you ever lived in University halls. It’s easy, it’s hearty and unless you have some very dishonest grocers in your area, it’s damned cheap too. Versatile to boot, because now as my chilli bubbles away on the hob I’m torn as to what my carbohydrate accompaniment of choice will be. Rice, couscous or jacket potato? While I consider the attraction of each option, you can think about these fun health related facts about the two main constituent chilli ingredients. Chilli peppers: high in vitamins A, C and K, magnesium, thiamin, niacin, riboflavin and folate. The ancient Incas were so wary of the potent effect of chillies to warm up the human spirit that they were banned at funerals. Wowza. 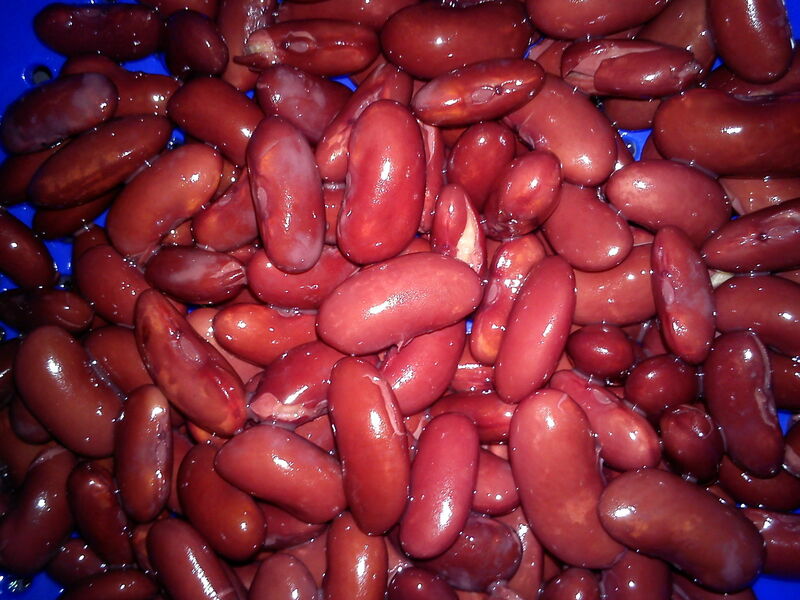 Kidney beans: high in B vitamins, great for diabetics and contrary to popular belief unlikely to kill you if you don’t prepare them properly. They’ll give you a gut ache from hell though, so if in doubt buy canned! I don’t hold to a set recipe beyond the two above ingredients- without fresh chillies and some kidney beans, it aint a chilli. You’ll find your own preference with it, so much so that I’m struggling to put down a full recipe because it’s so changeable. But here goes. It’s hard to mess this one up (unless you are so busy on a blog entry that you leave it on the stove on high and manage to weld the chilli to the pan base because it’s on too hot). Start by frying off the onion, garlic and chilli until the onions soften. Add now the cocoa powder and other vegetables. Most veg will work but mushrooms really are a winner, I’d avoid sweeter root veg like swede or parsnips. 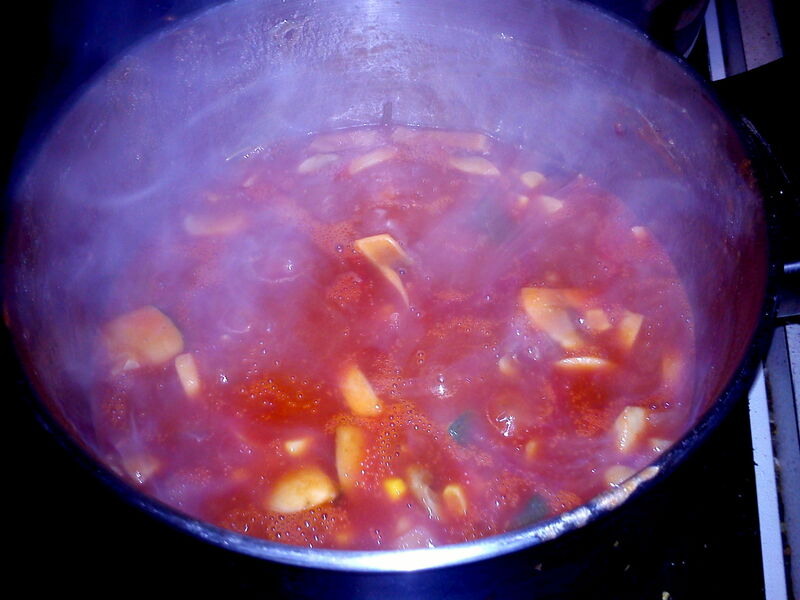 Cook off the veg mix lightly then throw in your beans and passata, sugar and cider vinegar. Stir well, remember to turn down the heat when it starts to simmer and leave for about half an hour. Put in fresh herbs of your choice at the end- I like some thyme but coriander or parsley will work as well. If you want to go with rosemary, chop very finely and add with the passata. Spicy steamy beany goodness. Just don’t leave it bubbling this violently or you end up with blackened mush. Not good. Trust me, I know. Keep it hot, serve it up with rice. Or baked potatoes. Or couscous. Or rice. Variations: One chilli will give a medium hot result here, add more if you like your dinner more burny than warm. I will say though that a little too hot is preferable to a little bit bland so rather than err on the side of caution put all the chilli in and have some soured cream on the side to cool it down if needs be. Some sweet red peppers or fresh plum tomatoes will richen the texture of your sauce. If you can’t go without the carne used minced beef or pork and add at the beginning. Canned tomatoes will work if you don’t have passata but I find the end sauciness is impaired if you go down this road.